Isn't it pitiful that I can not recall an outstanding night out over the course of 2009? Wait, don't answer that. I know we had a few date nights to go out to eat, maybe see a movie or something, but nothing really remarkable. I mean, it's not like we rocked out with Def Leppard or U2 or anything. But that's okay. Because a couple of weeks ago we went bowling. (Are you still reading?) We went with a few other families and it was a HOOT. The kids had a lane and the grown-ups had a lane. And there was popcorn. What more do you need? It was a fun night even though I broke two nails and really stunk at it. Would it be wrong to say the best workshop/conference was one that I was a part of? Okay good, then I'm going with that. I love bowling! So fun! I am having a hard time remembering my year beyond the past couple of months so these Year in Review posts have been hard for me. I think your bowling night sounds fun! It was fun--and a great opportunity for people watching. 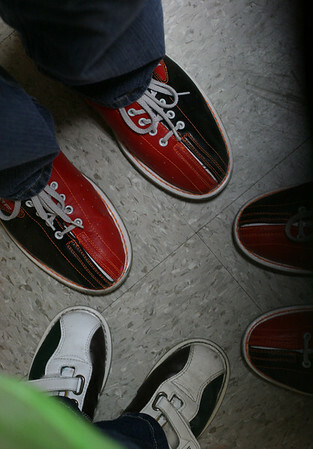 The regulars at the bowling alley make up an interesting subculture.